The LearnToMod online software walks you through a series of challenges that you complete in order to earn Minecraft badges. 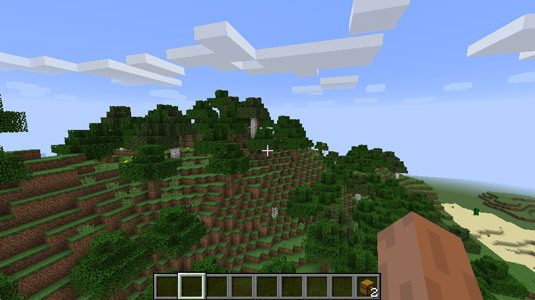 These challenges help show you basic programming skills and how to make Minecraft mods. Here, you learn how to log in to the LearnToMod online software, create and run your first mod, and share that mod with other modders. Signing up for the LearnToMod online software is quick and easy. It takes only about 5 minutes to complete the sign-up process and start earning badges. 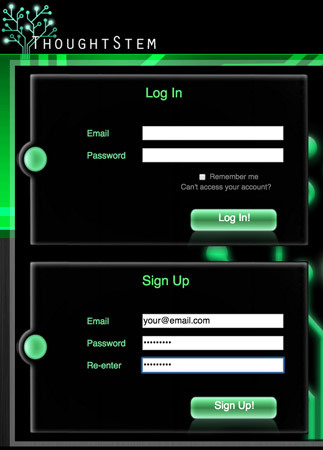 The first time you log in, the site redirects you to ThoughtSTEM’s login page to create your account. Use the Sign Up window (located below the Log In window) to create your LearnToMod account. If you need to, you can contact the LearnToMod customer service team at learntomod@thoughtstem.com. After you create your LearnToMod account, you are re­directed to a page that asks for your access key. Choose a LearnToMod nickname. Pick any name you want! You see the dashboard (the Home screen). Now you can start unlocking badges to learn how to mod! 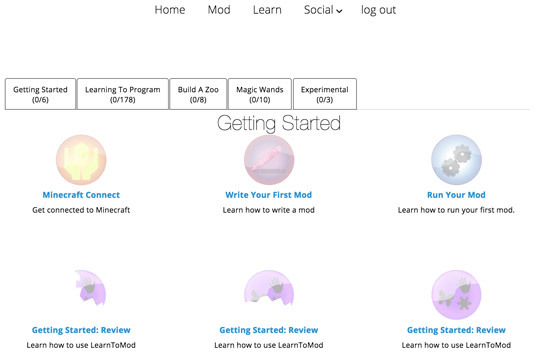 To access your LearnToMod badges, log in at mod.learntomod.com with the email address and password you used to sign up. You see the home page. To see the list of challenges, click on the Learn tab at the top of the home page. You see the first set of challenges. As you complete challenges, color is added to the badges so that they no longer appear shaded. Badges that are shaded have yet to be earned. 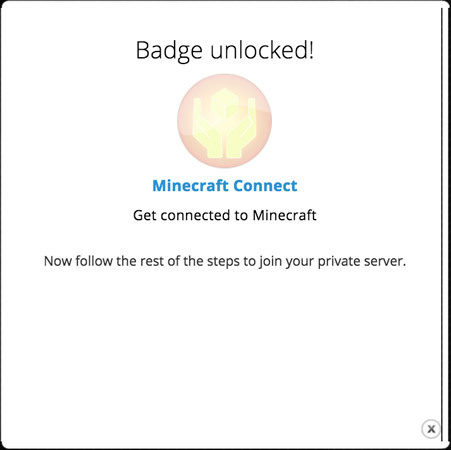 To get started, click on the first badge, Minecraft Connect. In this badge, you can find all the instructions to help you connect your mods to Minecraft so that you can see their effects in the game. 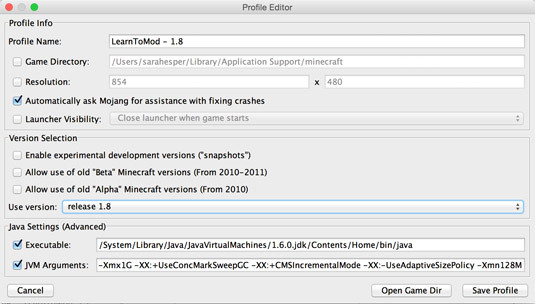 Click the Edit Profile button in the lower left corner of the Minecraft startup screen. In the Profile Name text box, name the new profile. Look at the Version Selection section to see which version you’re using. It’s in the Use Version text box. You should be using the version at the top of the list. In this case, it’s version 1.8. Change it to the most recent version. Create a new profile where you set the version to the most recent version. 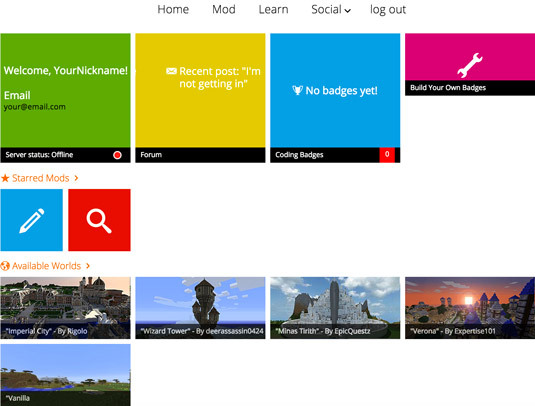 Add your Minecraft username to the LearnToMod account by typing it in the text box on the badge. Your username must be spelled exactly the same as you created it (including capitalization) in order for your mods to be connected to your Minecraft account. If it isn’t spelled the same, you can’t see your mods within Minecraft. The Minecraft Connect badge pops up. Under the text box in the Minecraft Connect badge, you see the text Success!. 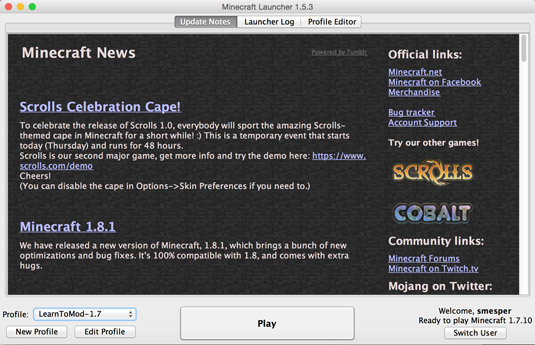 Click Play on the Minecraft home screen. Type Learn To Mod as the server name, and type play.learntomod.com as the server address. If you’re having trouble connecting to the LearnToMod server, email the technical support team at learntomod@thoughtstem.com. Whenever you’re connected to your testing world, you have a mod chest in your inventory, and you can play in either Creative mode or Survival mode.